Lunch Monday - Saturday: 11:00A.M. to 3:00P.M. Dinner Sunday through Wednesday: 4:00P.M. to 11:00P.M. Dinner Thursday through Satrurday: 4:00P.M. to 12:00A.M. At the school we offer cooking classes for cooking aficionados. We reveal all of our secrets and we create the dishes shown on our website and blog. Cocina Abierta also offers a boutique deli with a selection of homemade gourmet products. You will find a selection of breads from around the world and variety of jams, artisanal cheeses and meats, chutneys, and pates. Sweets, chocolates, and baked goods are available. Reservations are available for private dinners, celebrations and corporate events as well. We are an interactive culinary environment. At our restaurant we create and interpret the culinary ideas inspired from different cultures, products, and techniques. 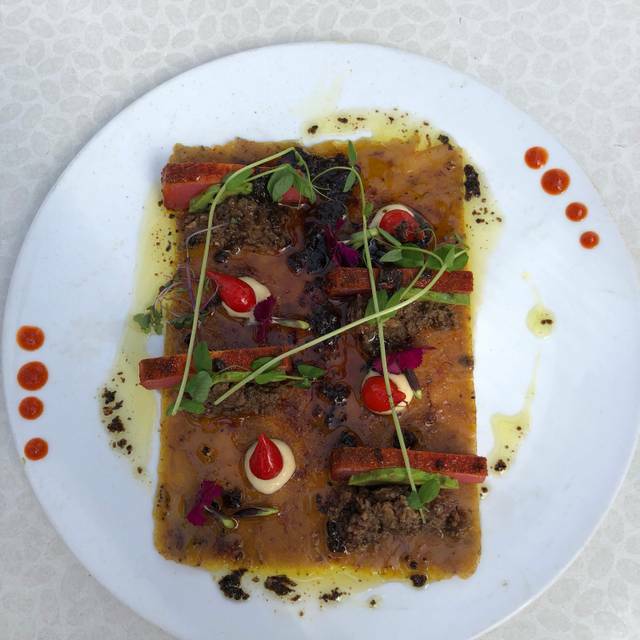 Our always evolving menu is a result of the interaction and interchange of different experiences. An open kitchen, eclectic and without limitations. Because cooking is our passion. Historically cooking evolved through the interaction and exchange of cultures. Through this premise and advances in technology our project, Cocina Abierta, was born, designed for the sharing and development for our passion. Cocina Abierta is a restaurant and school. ember roasted vegetables | burnt grapes | chironja "mojo"
We waited for thirty minutes and then my drink was incorrect. We waited for our our server to return with out check but she never did. The food was delicious but the dining experience was terrible. We found this restaurant simply because it was close to our hotel and looked unique as we passed it. 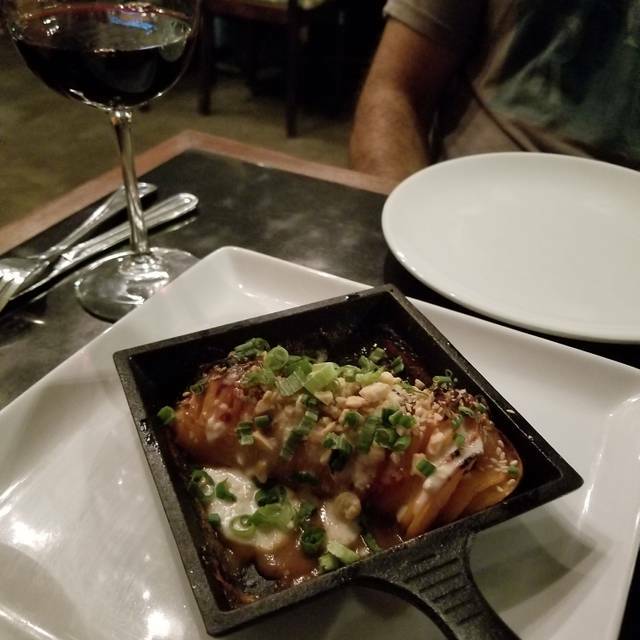 Once we saw the menu online, we knew we had to check it out. And it did not disappoint! The food was creative, beautiful and delicious! Narrowing down what to order, despite it being a sharing menu, was very difficult. We almost went back the next night to order more! Author cuisine in the middle of Condado. The menu changes weekly and always surprises. Good wine selection and moderate prices. Totally recommended. 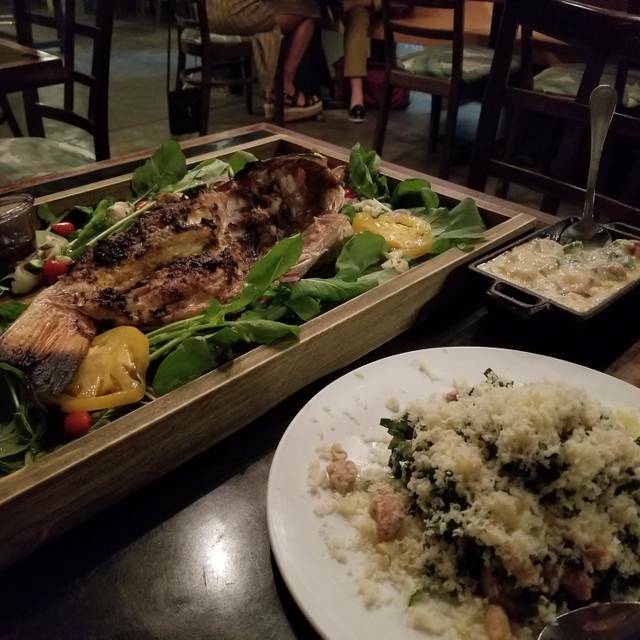 This was the best meal my wife and I had during our 5 day visit to Puerto Rico. We enjoyed a late lunch there on a rainy Saturday afternoon, and had the place virtually to ourselves (imagine that was due to the odd timing). Our fantastic waiter Fernando (hope I have his name right! ), put us right at ease and walked us through the menu. Perhaps because it wasn't busy, it felt like he was a friend giving us a private luncheon in his own, personal, well-appointed dining room (it was my wife's birthday actually, adding to the experience). The food was world class, the prices reasonable, and the service -- again -- a delight. The tuna course was a highlight, as were the croquettes. Actually, everything was excellent, can't go wrong. If and when we visit the island again, this will be the first place we book for a meal. Couldn't recommend it more highly. We have read several reviews of this place and were very excited to try it. The lamb Wellington was both tasty and perfectly cooked. The truck pork chop was juicy and Delicious. The wines by the glass list was creative. When the bill came we were pleasantly surprised as this is a value beyond compare to anything we had had in San Juan. Five stars. Quirky excellent menu and service. Great wine list. Great suggestions from our server. Neighborhood restaurant with fresh food but not memorable. Our party of eight had our table waiting and our waiter was excellent. Food was fabulous! We just asked our waiter to bring us what he thought was good and everything was excellent. We did have one person with dietary restrictions and they acomodated her. I would highly recommend to any visitors to Condado or San Juan. Great food and ambience - book outside if available but inside is nice as well. Checked in with no problems and was seated on the patio. After 10 minutes the server came over to answer any questions then left. 25 minutes went by no service no nothing. I wasn’t even poured a glass of water. I left without eating or drinking anything. This was a management failure. Guests expect at least a glass of water after they’ve been seated. Guests require communication if the restaurant is understaffed so that we may lower our expectations. The clock starts ticking when we sit down. If the restaurant isn’t interested in taking our money another one will be. The food was delicious, and we enjoyed our table until the end, when a large party was seated nearby and we had to shout to be heard. The only drawback to the meal was all of the food arriving at once. It was impossible to fit everything on our table for four (and we ordered less than was recommended). In addition, the hot foods got cold quickly, which forced us to rush through the meal instead of talking to each other and enjoying the experience. Luckily, we ordered only one meat dish, so the steak, at least, could be enjoyed piping hot. I hope to come back, but not with a big group and not with a big appetite. Very fast service also added a sense of rushing to the meal. What a lovely restaurant. They have such a friendly and accommodating staff. The food was delicious, and I took the server's recommendations, and I was so happy. The first courses were served within 20 min of ordering but the main dishes took aprox 60 min to arrive and the steak oredered was rare instead of med-rare. When returned, it was sent back medium well. Initially, the server was efficient , but while waiting for main dishes, did not follow-up with the kitchen( we were seated next to it), neither did he apologize for the delay. Overall a dissapointment. I did not get the hype. It was super busy, and hard to get a reservation . 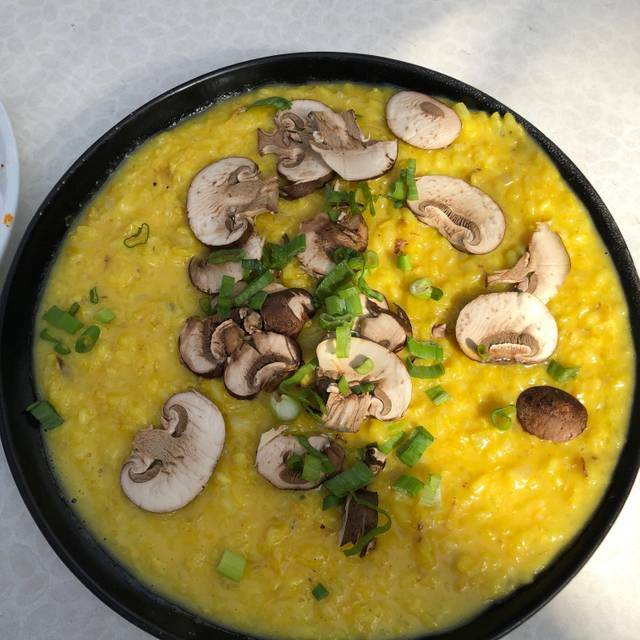 We started with the soup which was puréed with foam on top and fritters that were supposed to have mushrooms, but it was puréed mushroom. 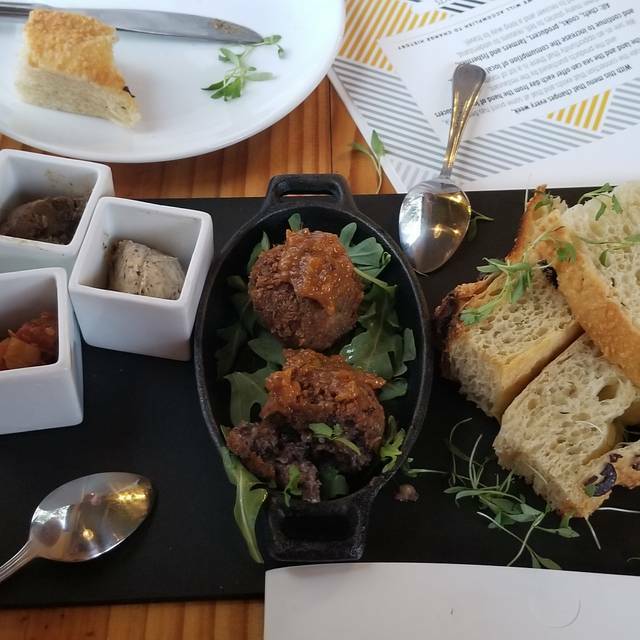 Both apps were like nursing home food, no texture. My husband had the jerk pork and did not like it I had lobster thermidor. It is the first time I have eaten lobster and didn’t like it. It was hard to eat. There was a weird taste. We were very disappointed. I would not recommend it. There are better restaurants to in the area. 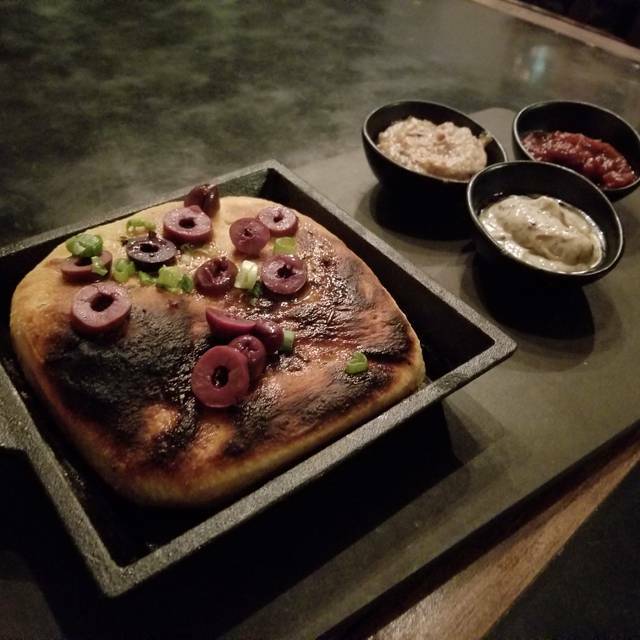 The bread was the star. Lobster was overcooked. Good ambiance. Better food around but overall okay. Excellent food. 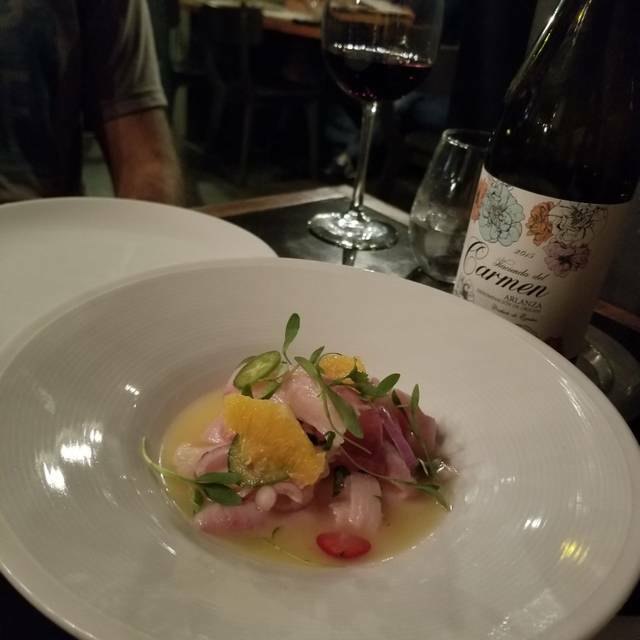 We were please you surprised by the quality and innovation of our meal at Cocina Abierta. Booked for lunch at the last minute and got a table outside on a small patio area adjacent to the restaurant. My wife and I shared plates, tapas style. Short rib empanadilla was delicious as was the zucchini pakora, but top marks reserved for the “made from scratch” gnocchi and ricotta. Good selection of wines by the glass. Service was friendly and efficient. Great meal. Highly recommended. One of the best meals I’ve had in San Juan. Everything was delicious and very reasonably priced. Service was great also. Fantastic! Great experience and delicious food! A must visit in Puerto Rico! One of a few amazing meals here in Puerto Rico that I had the pleasure of experiencing. Superb food and excellent wine, topped off with top notch service. Thank you! This was an excellent choice! We had the octopus tentacle, the tuna tatake, and the jerk pork chop. The smaller plates were truly delicious, but the pork chop was the best I have ever had. The menu was a little odd at first but easily explained by the server, who did a great job as well. Also, great location for us and outside seating was nice. Loved it! The food was excellent, imaginatively conceived and executed. The service was very good, attentive and informative. The room decoration was no better than OK, and though it was far too cold to be comfortable, that is easily the only negative I can think of. When we return to San Juan we will surely dine here. One of our favorite places in SanJuan. Always consistently spectacular! Seafood Curry, focaccia and empadillas were outstanding and priced reasonably. My short rib although plated beautifully lacked salt and the dipping sauce provided was mostly oil. It needed another sauce, perhaps something from a mir poix and some of the drippings. And at 37 dollars I was expecting a bit more of an effort. Very tasty Sunday Brunch Buffet. Good value for the price! The food is good but the service is extremely slow. We were two people and we had to wait 30 minutes to place our order. After we received the appetizer, we had to wait an entire hour (!!!) to receive our entres. The resturant was not even that busy. I complained and they took the entres off the check. Even though the food was very good and beautifully presented, they need to fix the kitchen timing and speed of service. I really, REALLY wanted to love it! We started with tuna tataki (which was only one of 2 dishes we actually sadly liked) and purple potato ( which we did not order.. What we wanted was the octopus appetizer tho)... Our waitress Paula I think is so soft-spoken that we could hardly hear her through the moderate noise level at the restaurant... Our mains were the green curry (for my standards subpar) and the short rib which was not tender at all. Our second favorite dish was the chocolate ganache however the passion fruit sorbet was waaaaay too tart). We had very high hopes for the restaurant but everything went up in flames when I was informed that they do not offer straws any longer for some stupid eco reason.. I only hope that the owners of this establishment drive electric cars like we do in NYC since he's so keen on saving the environment one straw at a time while I'm stirring $12 Margarita with my damn fingers! Wonderful Valentine’s Day pre-fix menu with wine pairings. Delicious, well paced, beautiful space, good service. We will be back. Very gourmet, very good. Service a bit spotty for the price. Cocina Abierta was our first meal as we arrived at our destination, San Juan, Puerto Rico. It was just a hunch and I based our trip here solely on pictures of the establishment which looked modern and well kept. We were pleasantly surprised to have a wonderful and creative meal! The menu is set up in order of acts: like a play. It is playful. 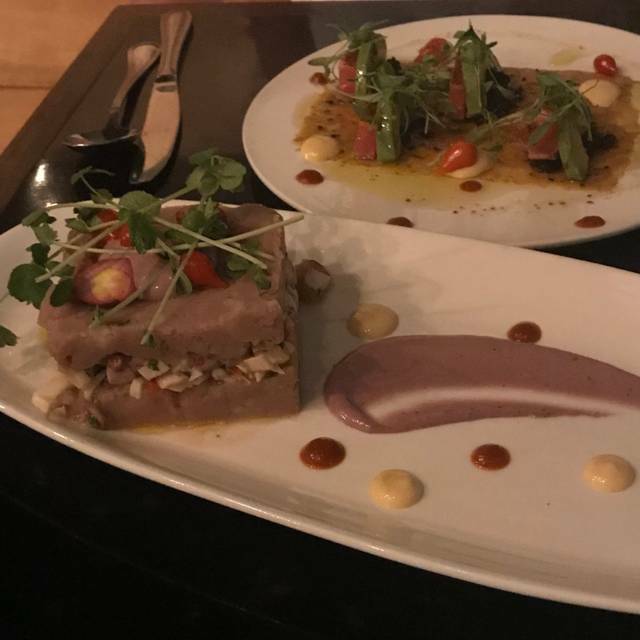 Our appetizer was a tuna tataki with plantain “carpaccio”. It was delicious. Very savory and with a bit of spice but thoroughly enjoyable and well balanced. Our next dish was the empanadas made with an onion or scallion ash dough. This gave them a strange grey / blue tint but they were probably our favorite dish of the night. I can’t even tell you what they were filled with. Some sort of meat cooked low and slow and fork tender! Outstanding and someone needs to make a good truck selling just these! We could have had a dozen! The entrees were good if rather pedestrian. 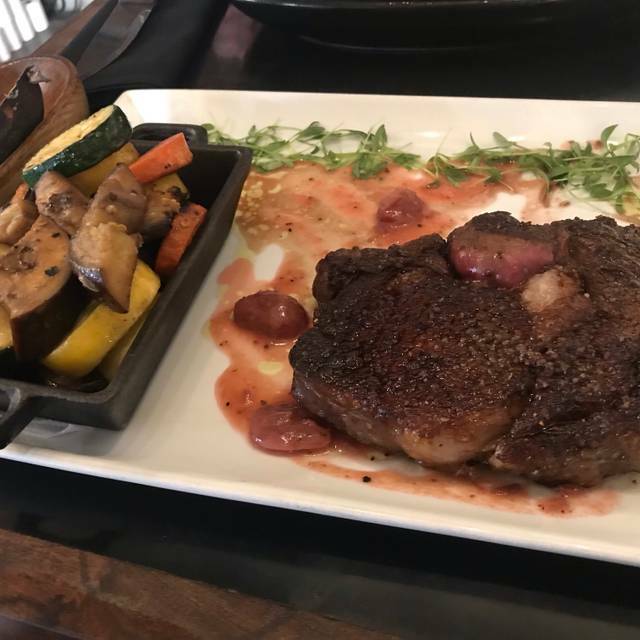 My girlfriend enjoyed a short rib dish that was interesting but not quite as tender as I would have thought and I had the ribeye that was more medium well than medium but flavorful if a little tough. But for $37 I wouldn’t complain. It was decently executed. I recommend to probably stay in the seafood realm or try many of the appetizer or smaller acts. We would try again and were very happy. Service was slightly under attentive and over explanatory but very friendly and so we had a very nice experience. Excellent as always!! One of my favorite restaurants..
Really terrific creative dining experience. Wine list was great with pairing options available for each dish with appropriate sizes. We enjoyed this restaurant so much that we went there twice. The food is delicious. Love the atmosphere. Service, food, ambiance — all was wonderful! I only wish I was dining with someone so that I could have tried more! The roasted cabbage dish will be a landmark one for me. It will not be forgotten.